During the last few years, many homeowners have struggled just to pay their mortgages, let alone save extra cash for home remodeling and maintenance. But things are looking rosier. According to a major report released by the Joint Center for Housing Studies at Harvard University, the U.S. home remodeling industry is poised for a new decade of growth, as both the economy and the housing market begin stabilize. Over the coming years, homeowners are likely to have more money to reinvest in their homes, with spending on remodeling expected to increase at an average annual rate of 3.5 percent. Here are five popular home renovations, both inside and out, where concrete can offer the best long-term value for your remodeling dollar. 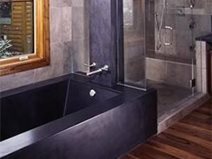 If you're planning to upgrade a bathroom, concrete can be used to customize nearly every surface, including the vanity, the sink, the shower enclosure, the floor and even the bathtub. With concrete, you can size and shape elements to fit any space and choose a color scheme that complements or matches your existing décor. 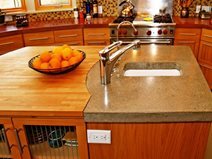 Concrete is also waterproof, mold-resistant and low maintenance. See these ideas for using concrete to remodel a bathroom. 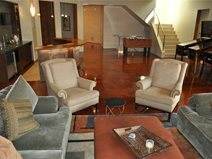 Concrete resurfacing is a growing trend with homeowners looking to refinish old, worn concrete floors or exterior pavements. 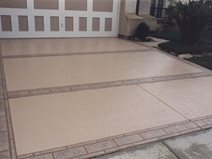 By using today's high-performance concrete overlays and coatings, you can make worn concrete look like new again or completely upgrade the surface with a new color scheme and pattern. And in most cases, resurfacing costs much less than concrete removal and replacement, saving you money you can use to upgrade other areas of your home. If you are sick and tired of maintaining that splintering, faded wood deck, why not replace it with a material that will last a lifetime and require little maintenance? Concrete is a superior patio material, both in terms of performance and design versatility. 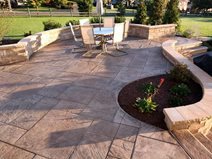 See Top Benefits of a Concrete Patio.